I warned you there’d be more than a few cold salads during the summer. This is one I’ve been cultivating for a few years and it’s getting very near perfect (for me at least). Many different kinds of bean salads can be found on picnic tables throughout the summer; sweet ones, vinegary ones, baked beans (ok that might be stretch but a big crock of cold baked beans at a summertime BBQ is delicious). This white bean salad is a snap to make and is one of those rare dishes that is even better a day or two later after the flavors meld together. If you’ve been following or have read some of my previous posts you know I’m a fan of using dried beans over canned. They’re not as difficult to use as they may seem. You can soak them overnight but if you’re like me you never remember to that until the morning. Using the quick-soak method works fine, shortens your cooking time, and still delivers flavor. 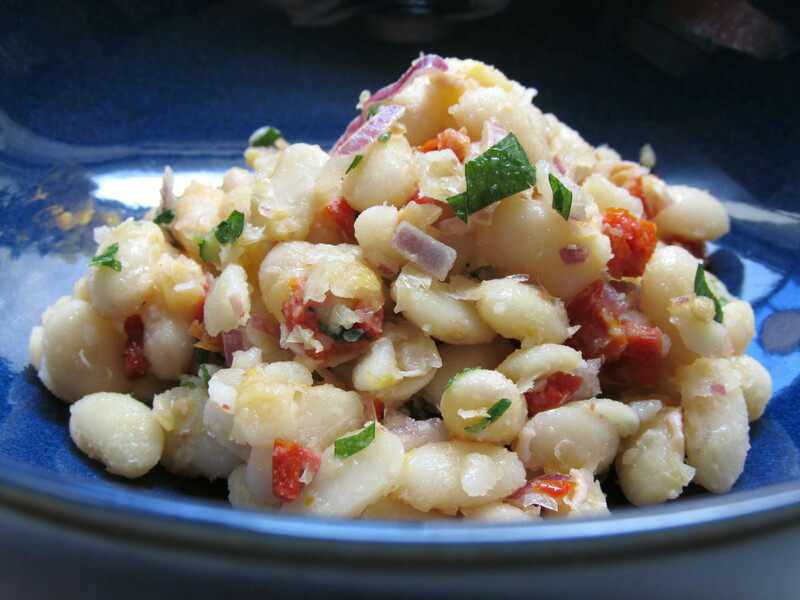 In the past I’ve used red peppers in this instead of sun-dried tomatoes and the peppers add some crunch to the bean salad but I like the sweetness sun-dried tomatoes add. They’re like small power packs of concentrated tomato (actually they’re not like small power packs, they really are). This is another salad you can get creative with. Want some added protein? Dice up some crispy bacon or smoked sausage and mix it in. Hmmmmm, see? I told you this one was nearing perfection! In a large pot add the beans to 8 C salted water. Bring to boil over high heat. Boil for two minutes. Remove from heat and cover. Allow to soak for 1 hour. Drain beans. In fresh 6 C of water, bring beans to simmer over medium heat and cook until tender, about 30-45 minutes. Be diligent in checking them! I’ve found these particular white beans cook faster than others. When beans have reached desired tenderness, remove from heat and drain. Place in a large bowl and mix in the tomatoes, onion, and parsley. Add lemon zest, olive oil, lemon juice, and toss together. Add salt to taste. Chill in the refrigerator until ready to serve. It tastes even better if chilled overnight. Many great things happen at the table with friends and food.